CUPERTINO, CA (PR Buzz) – February 18, 2019 – – The rise of technological advances in this fourth industrial revolution era poses both risks and opportunities to business leaders. Thus, people on top should seize every opportunity to effectively communicate with their workers and customers. This can only be done by investing in work systems, both process and software, that will guide them in aggressively determiningthe company’s needs while being able to instantly provide the customers' needs. Sunil Upadhye is an enterprise agile coach with decades of experience in the field of information technology and commendable business leadership through agile transformation. "Driving Results and Value as an Enterprise Agile Coach" reflects his passion for business innovation. He wrote over 140 AHAmessages® that agile coaches need to embody to capture the interest of their valued clients and continuously provide solutions for the customer's ever-changing needs and requirements. In this AHAbook®, Sunil presents the impact of servant leadership in the business as not just merely controlling and commanding a team but also deeply understanding the issues that could make or break the people and the business. He lays down inputs on how an ideal enterprise agile coach should think in orderto be able to instill customer-obsession mindset to the team, letting each member of the workforce function as if they own the business. 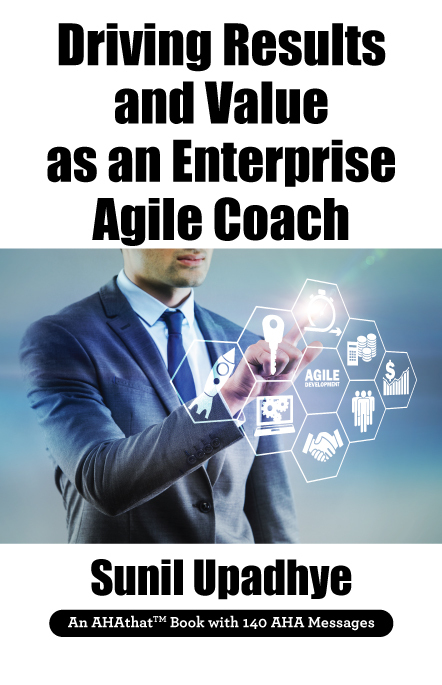 With Sunil's AHAmessages to enterprise agile coaches, the business can proactively attend to the needs of their customers through strong and constant collaboration. "Sunil Upadhye's book is an eye-opener to enterprise agile coaches, as he has pointed out the key elements to drive results to the business. This includes, among others, an effective communication process within the business and toward the customers," says Mitchell Levy http://aha.pub/MitchellLevy, Global Credibility Expert and The AHA Guy and Thought Leader at AHAthat® (https://AHAthat.com). You can read the entire book’s content at http://aha.pub/AgileCoaching. The meaningful AHAmessages in this book is worth a share to business leaders, company workers, and all your followers on your social media accounts. AHAthat makes it easy for you to establish your expertise. Whether by sharing high-quality content of thought leaders from around the world (over 47k AHAmessages that you can share in seconds, for free) or by quickly creating a thought leadership book of your own. You can press the “easy button” by having us ghost-write your book and run an Amazon bestseller campaign. If you want to write it yourself, you can follow a simple three-step writing process. Visit https://AHAthat.com/Author for more details. We also encourage you to read your book out loud so we can distribute the audio version on 23 audio platforms and incorporate it on to AHAthatRadio https://AHAthatRadio.com, where AHAs stream 24 hours a day. All content on the platform is curated by THiNKaha, which has published over 800 physical and e-books. Visit https://AHAthat.com and start sharing compelling content today for free in seconds.